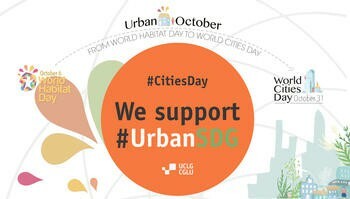 On the occasion of World Habitat Day 2014, UCLG calls upon its members to participate in the #urbanSDG Selfie Campaign, which will culminate on 31 October with the first #WorldCitiesDay. For the first time ever, this October, two important milestones in the urban calendar will coincide in the same month. As usual, on the first Monday of each October, which this year falls on 6 October, the world will be celebrating World Habitat Day. This year´s new addition is the celebration of World Cities Day #CitiesDay on the last day of the month, 31 October. The celebrations, events and activities taking place around these two days can be grouped together under the umbrella of Urban October. Urban October will bring together many of the initiatives on advocacy, outreach and communication on sustainable urban development. Urban October is a month for raising interest in urban challenges, for stimulating debates and moving forward commitments. With important global agendas in the process of being defined, UCLG calls upon its members and partners to mobilize and raise awareness about the transformative potential of urbanization and the significant role that well-managed cities with strong institutions accountable to citizens can play in a sustainable future for all. We encourage local and regional leaders, mayors, presidents and elected representatives to participate by taking a selfie with the hashtags #urbanSDG and #CitiesDay. It´s easy! Join the campaign! Show your commitment to contribute to the sustainable development agenda and Habitat III.